I'm proud to be a part of MOLAA’s Beyond The Earth and Sky: Día de los Muertos Exhibition, a juried display of contemporary works by artists residing in Southern California. 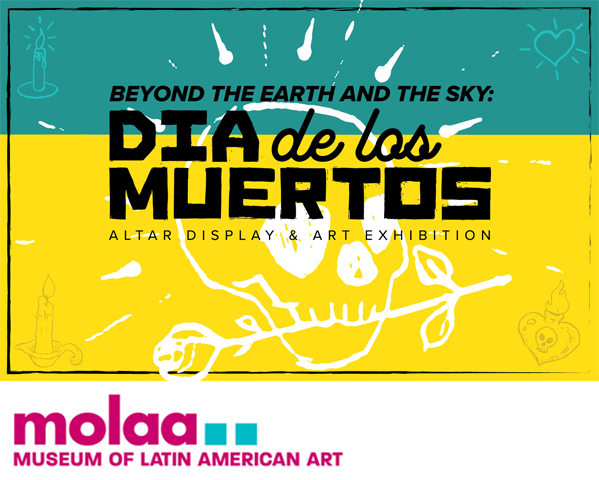 The art and altars are on display to the public from September 26th through November 11th, 2018 in the MOLAA Education Gallery, and are featured as a part of MOLAA’s Día de los Muertos curriculum. If you live in Los Angeles or Orange County, I hope you come by to see the show! I've been working on this mandala for some time now; it was one that I had to put away for a bit and come back to. 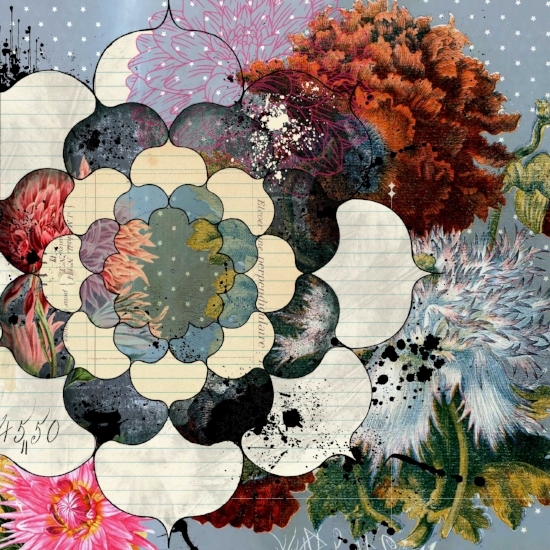 It's created with layers of drawings, vintage book illustrations and ephemera, old printer’s ornaments, and paint. The Passion Flower symbolizes the sacred in all things, and passion in every sense of the word. 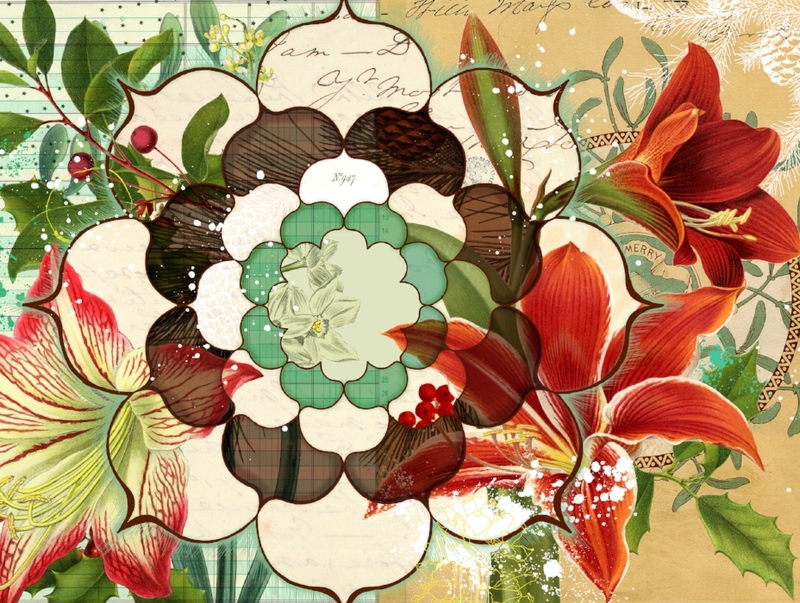 This spectacular flower represents opening yourself completely to explore the innermost sacred passions of your heart. Passion Flower climbs high toward the heavens with joyful, curling tendrils, and encourages you to do the same. The first time I saw a Passion Flower I was 25, and it was so shocking and otherworldly that I thought it was an alien flower that had crash-landed on a spaceship! I've been somewhat obsessed with them since, and recently saw some at the Butterfly Pavilion Exhibit at the Natural History Museum. They were covered in beautiful butterflies! I'm super proud to be included in the second iteration of Hecho a Mano (Made by Hand) at Gallery 825. Juried by Curator Jill Moniz, the exhibit will feature objects created by emerging artists and explore issues of quality workmanship and cultural heritage. The exhibit opens this Saturday, August 11, 2018 and runs through August 24, 2018. 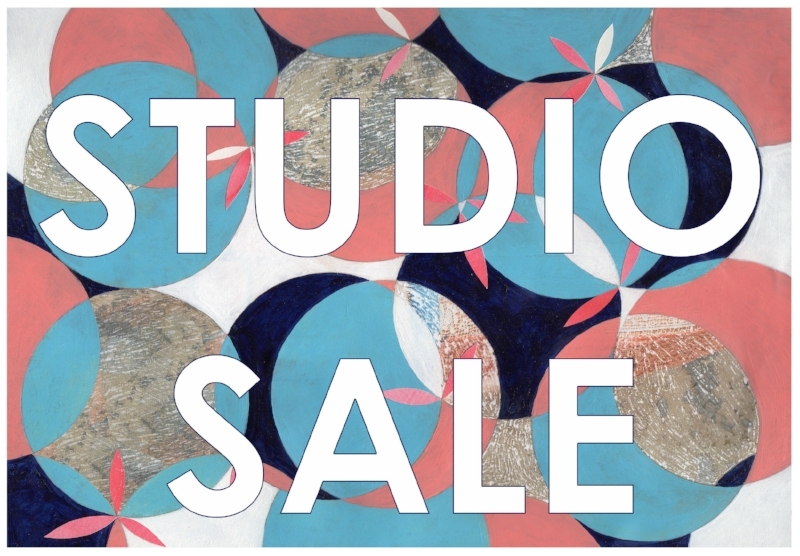 Featured artists: Stefanie Bauer, Maria Bjorkdahl, Lorraine Bubar, Donna Buch, Suzanne Budd, Kerry S. Campbell, Andrée B. Carter, Chenhung Chen, Annie Clavel, Mike Collins, Bibi Davidson, Megan Frances, Dwora Fried, Karen Frimkess Wolff, Shelby Harris, Shelley Heffler, Marie-Laure Ilie, Jeff Iorillo, Julienne Johnson, Caroline Jones, Sharon Kagan, Veda B Kaya, Rajiv Khilnani, Kim Kimbro, Shelley Kommers, Faina Kumpan, Ibuki Kuramochi, Campbell laird, Rich lanet, Sungjae Lee, Monica Lloyd, Bachrun LoMele, Deborah McAfee, Janet Milhomme, Lena Moross, Ashton Phillips, Don Porter, Osceola Refetoff, Samuelle Richardson, Catherine Ruane, Kuniko ruch, Carl Shubs, Nela Steric, Tree Stokes, Young Summers, Lauren Thomas, Terry Tripp, Philip Vaughan, Monica Wyatt and Mara Zaslove. When: Opening Reception: Saturday, August 11, 2018, 6 - 9 pm (show runs through August 24) Where: Gallery 825, 825 N. La Cienega Boulevard, Los Angeles, CA 90069 Admission: Free and open to the public. This is totally late now that it's the new year, but I had the immense pleasure of creating a wintery mandala — as a double-sided wrapping paper! — for Ma Vie Magazine a few months back. I chose Amaryllis as the main floral, which literally means "to sparkle", and included other December greenery like paper whites, pine, holly and mistletoe. It was a really fun project to work on. If you're interested, you can find the magazine here. It’s a gorgeous issue, I really wish I could read German! There's also a little interview with me. My initial thoughts were to make a piece that would work for a boy or a girl -- but halfway through, pink began calling my name. (I might have to make a companion piece in light blue.) It's a happy, lovely piece, especially when the sun hits it. I imagine a little person looking up at it and daydreaming-- there is a lot to discover. If you're interested in the piece, you can view it at the just-opened Roots & Wings in Malibu, or contact me for more information. You can also catch a glimpse of it here. Wishing you a big bowl 'o happy! You might have noticed that my Mandala Project is taking a decidedly floral bent as of late, and there's a reason for that, but I can't share just yet. Both of these images are available as prints in the shop. I have finally finished this piece that I started ages ago. It began with a background of Los Angeles Times newspaper headings and pages ripped out of a very old Thomas Guide of LA County (I still had mine from my college years and couldn't bear to throw it away!) I was careful to rub off a lot of the text so that not a lot of words are legible, and the result is like one of those walls where handbills and posters are pasted up, ripped off, and covered over and over again. I'm not sure why this one took so long, but I'm very happy with the way it turned out. It measures 11 x 14", and as with most pieces made with gold leaf, it changes with the light. Cactus Flower symbolizes endurance; the ability to thrive and create beauty from what is inside, regardless of what is going on "outside". The cactus stands tall in the scorching and freezing desert without a drop of water, then turns around and produces glorious flowers. I love this symbolism! Prints available here. I love creating custom mandalas. It's my chance to take a peek into someone's heart and mind, and create a piece of art that is a reflection of who they are. I begin by gathering information about the person, and in this case the friends supplied me with tidbits they felt were important, including symbols, loves, and sentiments. One important symbol that her friends shared with me was a six-pointed star, so that's where I started: it forms the center of the hand-designed mandala. Here is the initial layer of collage and paint on the 24 x 24 inch canvas. The mandala design is barely visible, and I've just added the first bit of gold leaf. Symbols included here are Hawthorn Tree berries/leaves/blossoms, bees, phases of the moon, and Mistletoe. Here is the piece a couple of days later with some blueish-green added, more gold leaf, and more white. I knew that I wanted the flowers, berries, and leaves to be an important part of the piece, so I used frisket to mask those images to protect them from the deep color I was using for the background. I also got really stuck at this point! When the piece I'm working on starts to look good, I get nervous that I'm going to mess things up. This is when I slow down a bit and stare at it for a loooooong time. Here it is with a deeper background color, and the frisket rubbed off of the Hawthorn bits. It's a little bit "busy", but almost there. And finally: the finished piece! Deeper background color, last bits of gold leaf added, as well as the stag lower right, and a few "surprise" elements on the side and bottom that aren't visible here. It's so difficult to photograph these pieces accurately, as they change with the light. 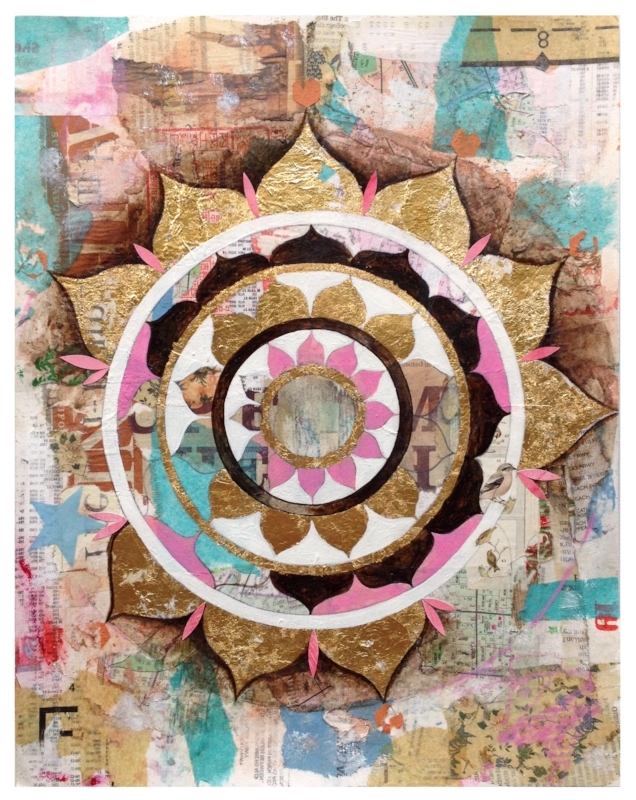 This mandala glows and radiates so much joy and life, it was very hard for me to wrap it up! Included with the mandala is a write-up of all the symbolism in the piece. About half of the symbols were intuited by me, and I was thrilled when the feedback on the photos was "It's like you know her!" I hope the lovely lady who I made this for loves it as much as I loved making it. If you are interested in commissioning a mandala for yourself -- or someone you love -- send me an email and let's talk! I'm very proud to be included in the Art As Protest show at the Orange County Center for Contemporary Art. The show opened last Saturday, and I'll be at the 2nd reception, which is Saturday July 1st. The gallery space at OCCCD is stunning, and downtown Santa Ana is a bevy of art galleries, artist studios and cool eateries. If you are in the OC, I hope to see you there! Prints are available in the shop. 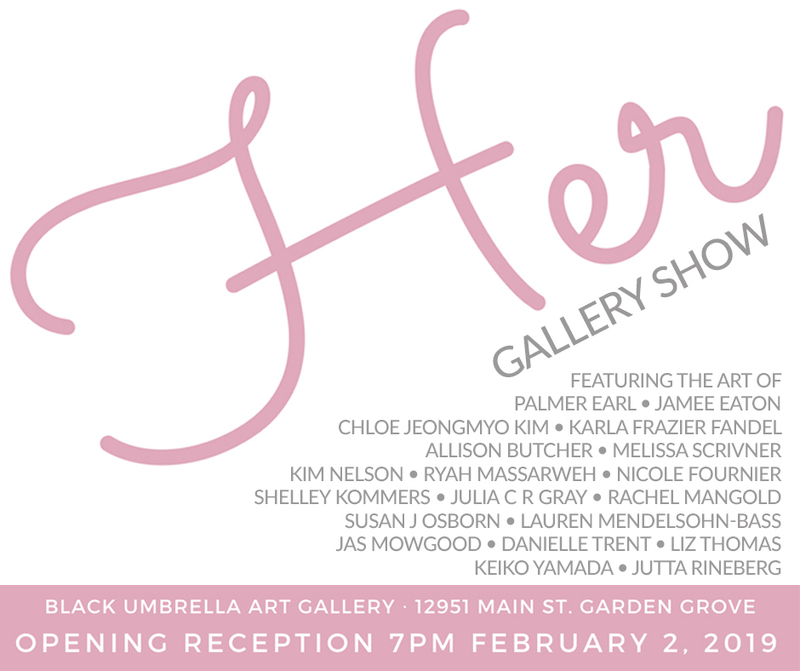 I'm super proud to be a part of bG Gallery's Word Jumble Gestalt show opening up this weekend in Bergamot Station. This is a different type of gallery show in the best way: each artist was assigned a word to create a new piece of art, and each week a new poet will arrange the works into a new poem! How cool is that? Opening reception is this Saturday, May 20th, from 6-8 PM. The kiddos and I will be there for as long as their patience lasts, and I hope if you are in the area you will stop by to clink wine cups with me! Bergamot Station is one of the most wonderful art destinations in Los Angeles, so I hope you join me. Participating artists are: Daggi Wallace, Dijana Skoric, Elisabeth Stokkebye, Shelley Kommers (me! ), Dmitriy Dimus, Nat Sufrin, Patrick Quinn, Sheila Ross, Dakota Noot, Anne Collins, Linda O’Neill, Joel Armstrong, Shizuko Greenblatt, Meena Khalili, Hans Neleman, Mick Bacich, Tania Sen, Sarah Stone, Mara Zaslove, Aneys Galleani, SameSource and more to be announced. Where: BLEICHER/GORMAN (bG) Gallery Bergamot Station – Space G8A, 2525 Michigan Avenue, Santa Monica 90404 Phone: +1 (310) 906 4211 Hours: 10-6pm Tues-Sat or by appointment. I had so much fun being pampered on Mother's Day that I missed out on sharing this beautiful collection of art and writing curated by Tara Sophia Mohr. I'm incredibly honored that my artwork is part of this stunning project! It is a heart-warming collection of writing about mothering and being mothered, and each of the contributors - authors, spiritual teachers, business leaders and more - bring heart, honesty and vulnerability to their writing. I am so touched at the stories that accompany my artworks. I'm still smiling. Mother's Day was a few days ago, but this is a lovely gift any day of the year. You can download your free copy here. My Pinwheel Print at Pottery Barn Teen! I can't believe I've forgotten to mention this, but my Pinwheel Print is finally available on the PBTeen website! It's such a happy, colorful, summery piece, and there are tons of sizes to choose from, and if you need a frame, they've got you covered there, too. This is such a dream-come-true for me. I spent so many hours looking through Pottery Barn catalogues when I was younger, daydreaming about the possibility of seeing my own work in the pages one day. Yay! I'm proud to be a part of SugarMynt Gallery's Allergies: The Flower Show... three of my mandalas will be on display at tonight's opening from 7-10 PM, and the show will be up until May 7th. Participating artists are Bonnie Lambert, Brenda Cibrian, Clovis Blackwell, Dany Paragouteva, Dani Manning, Douglas Alvarez, Kelley & Cricket, Lori Hutchison, Rob Grad, SaraRose, Shelley Kommers (me! ), Shula Arbel, and Terri Berman. SugarMynt Gallery is located in an adorable old house in South Pasadena, about six blocks away from where I used to live when I was going to Art Center. South Pasadena was up-and-coming back then, but now it is a thriving (and very cool!) town full of lovely boutiques, eateries, and general awesomeness. If you are in the LA area, please treat yourself and come by! I've seen several photographs of the show going up and it looks amazing! Another beauty for the shop: my Dahlia Mandala. There is a beautiful underwater quality to this piece, and a summer's night feeling, too. Dahlias symbolize inner strength, positive life changes, and staying graceful under pressure... especially in challenging situations.